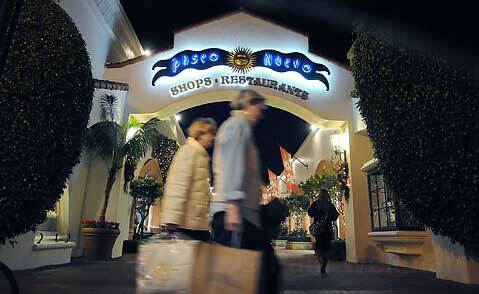 Shoppers skitter around State Street's Paseo Nuevo. Black Friday-giddy crowds, pushy parents, long lines. Before setting out to cover Santa Barbara’s Black Friday this year, I envisioned a buying, rushing frenzy worthy of Discovery Channel coverage. Let’s take a moment to recall last year’s Black Friday tragedy, when a store clerk at a Long Island Wal-Mart was trampled to death by an impatient consumer-crowd. Madness. I also learned of November 27th’s alternate “holiday,” Buy Nothing Day, when consumers are encouraged to “Buy Nothing!” Established in Vancouver by performing artist Ted Dave, Buy Nothing Day has become an international “day for society to examine the issue of over-consumption,” as stated in a 2006 BND press release. I hoped to see Buy Nothing Day protesters participating in various BND events, like the Zombie Walk through department stores, or an empty shopping cart conga line. So my first Black Friday in Santa Barbara, I armed myself with a pen and paper, stocking water and small snacks in my shoulder-bag. I was prepared to wrangle with a clawed, crazed mob. I was surprised to step into an overall very merry State Street crowd. Kind of like during a down-sized Fiesta, State Street was full of shopping bags and good vibes. The retail workers I spoke to didn’t appear stressed, not even at Old Navy, which opened its doors at 3 a.m. this year-two hours earlier than they opened last year. Incentive for waking up, besides first dibs on deals, was that the first 50 costumers to step through Old Navy’s doors received a free Rockband Game. I walked past one street performer after another and another, all out to capitalize on the increase of passers-by, as well as a representative from the Macerich company giving out free gift cards. When I asked a smiley Gap employee how Black Friday was going for him, he replied that it was exciting, and that he was having a lot of fun. An employee at L.E.I. had similar sentiments. “Black Friday is going just fine,” she answered, with a face that said, of course. Witnessed Buy Nothing Day Zombies: 0. Black Friday stampede-related death toll: 0. Gifts for my family for Christmas: Information not yet available for release. Overall, one might describe Black Friday in Santa Barbara as rather pleasant, with spending trends similar to last year’s, except most stores noted less frivolous spending, with customers tending to gravitate towards more useful presents for themselves and their loved ones. Usually, Internet savvy shoppers wait until by Cyber Monday to catch Black Friday deals online, but this year Black Friday sales were also available on store’s websites, so Black Friday 2009 also saw an increase in e-commerce. Nationally, it looks like sales were actually up this year, perhaps partially due to the fact that many stores extended their Black Friday hours.